Brendon McCullum became the 1st Kiwi player to blast a triple century and Jimmy Neesham assisted him with a ton as misery for India continued on foreign soils. 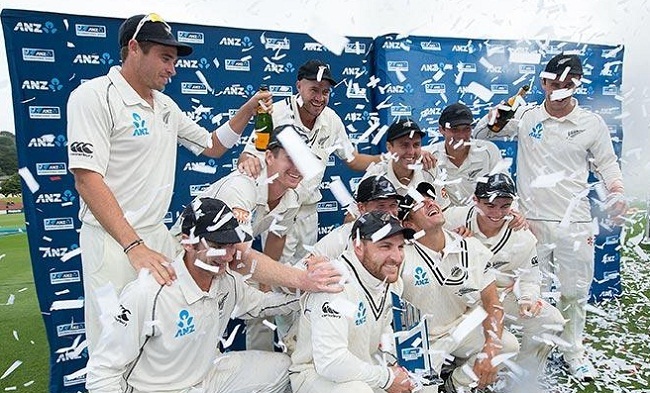 The Black Caps managed 192 in the first innings but they came back strongly in the second by hammering 680 for the loss of eight wickets declared. The visitors smashed 438 runs in their first and scored 166 with seven wickets in hand after 52 overs. 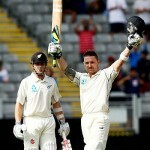 Brendon McCullum, the skipper of New Zealand, was declared ‘Player of the match’ for his scintillating knock of 302 runs. The second and final Test concluded on Tuesday, February 18, 2014, at Basin Reserve, Wellington. Earlier, the hosts went into the final day at 6-571 after 189 overs whereas Brendon McCullum and the debutant, Jimmy Neesham, were batting at 281 and 67. The duo flew off positively, they were playing their shots at will and the latter thrashed his maiden Test hundred in the 10th over of the day. McCullum powered his triple century with a four as the entire Wellington and New Zealand erupted to acknowledge his great achievement. It was the first ever triple ton by a Kiwi batsman who was finally dismissed for 302 off 775 balls with 4 lofty sixes and 32 fours. Jimmy Neesham remained unbeaten for 137 and the home side amassed 8-680 in 210 overs when their innings was declared by McCullum. Zaheer Khan was the most successful bowler with five, Mohammed Shami held two and Ravindra Jadeja got one wicket. India was given a tough task of scoring 435 runs in almost 67 overs and they started off miserably by losing their openers at 10. The Kiwis were denied a caught behind off Virat Kohli at 15 which was confirmed by the Snicko meter. The third wicket was surrendered at 54 when Rohit Sharma joined in with Kohli who attained his fifty in the 32nd over. The batsmen kept on stabilising and the runs were flowing freely from their willows. Virat Kohli registered his 9th Test hundred with a boundary and secured his end for 105 off 135 with 1 six and 15 fours when the match was called off. Rohit Sharma was at the other side for 31 while India reached 3-166 in 52 overs. Tim Southee was the top wicket taker with two and Trent Boult chipped in with one. 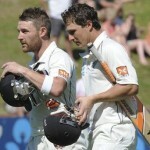 The interesting encounter ended in a draw and New Zealand triumphed in the two Test series at 1-0.